Linde and Charley have covered their bases rather thoroughly in this expose of crime solving-gone-public, but I need to chime in and throw a couple jabs. Once NBC proved Law and Order spin-offs could be just as successful as the original, and CBS followed with CSI and its franchise, there was no stopping the explosion of investigative television into every type of programming possible. And while I tend to agree with Ms. Murugan that unconventional crimesolver television is not quite a genre just yet, it is without a doubt a solid subgenre, or perhaps trope, of an established genre. It is not a mystery that I myself am addicted to FOX's Bones that is not so unconventional as Veronica Mars or The Mentalist, but it does use scientists and artists in a fictional Smithsonian Institute, known on the show as the Jeffersonian Institute, to assist the FBI through an analysis of bones, bugs, dirt, chemicals, art renderings, and genius-level 'quantum leaps.' More than this, the show's characters lend to an on-going narrative of objective science versus subjective humanity. Two shows that have yet to be mentioned in this discussion that have done well enough to give this convention some weight are CBS's Numb3rs and FOX's House. In the first, An FBI agent calls on his genius mathmatician brother to solve crimes through formulas, graphs, chalkboards, and math so difficult nobody can question it. Not the greatest show, although featuring David Krumholtz as math whiz Charlie Eppes and Peter MacNicol as his university colleague, Numb3rs is in its fifth season and sould be used by math teachers everywhere to answer the infamous question, "when will I ever need to know this?!" House, the Emmy and Golden Globe nominated and winning program, is FOX's fantastic medical drama that I include in this crime solving programming because of the episode narrative structure: patient with mystery ailment comes to the ultimate doctor-meets-detective, Dr. House, along with his team of interns and doctors, who investigate not just the body, but the home, personal, interpersonal, and professional history of the patient to solve the case within the last ten minutes of the hour-long program. 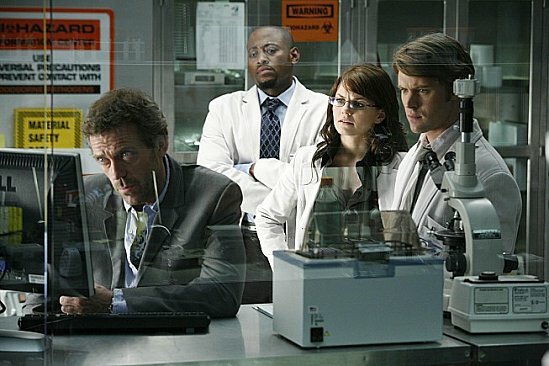 While there is no crime per-se in House, the crime-solving structure on a medical program and the doctor as detective are great techniques that allowed the show to last so long. These, and of course, great writing and Hugh Laurie's incredible acting. As an addict of these programs, I hope there is a future for the structure. With the success of The Mentalist, I am certainly not alone. But with the cancellation of Pushing Daisies, Veronica Mars, and a show you may not even know existed - New Amsterdam, from last season - about an immortal cop who uses his experiences from past ages to help solve contemporary crimes, there is a delicate balance of convention and unconventionality, style and narrative needed for theses shows to succeed. ADDENDUM: Not included partly because it is not American and mostly becuase I forgot about it while writing this, The amazingly hilarious BBC program, Dr. Who, that combines science fiction and crime solving is one of the longest surviving unconventional crime solving programs and should get an American rip-off soon if it's not already in the works. Catch it on BBC-America for now, and fall in love with ridiculous special effects and over-the-top everything.